The Parent /Child class meets two mornings a week on Tuesdays and Thursdays. The class is offered to children between the ages of 12-25 months with a parent, grandparent or caregiver. On Tuesdays the class is guided by an experienced professional who is a licensed school social worker and Montessori alumni parent. 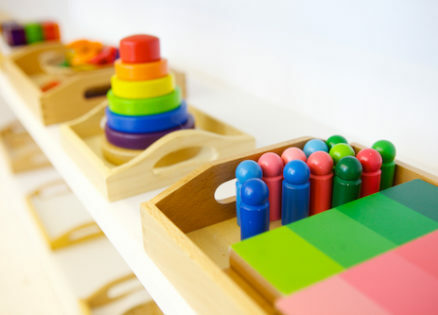 Toddlers are encouraged to play, learn, explore, and discover using age appropriate Montessori materials. This environment encourages interaction for all parents and caregivers to openly exchange information and discuss developmental challenges and milestones. The class culminates with reading, music and snack. The Tuesday program is run in two separate sessions for 1 1/4 hours. The Thursday Parent / Child Montessori Morning is an introduction to the Montessori environment and theory for both parent and child. This class is run by a certified AMI (Association Montessori International) Primary Teacher with 8 years teaching experience who will guide both parent and child in the start of their journey with the Montessori method. 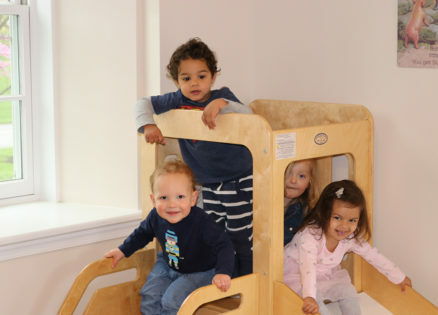 The prepared environment will aid the child in the development of concentration, language acquisition, coordination of movement, independence, and instill a love of learning. For parents, the program will aim to demonstrate different ways to interact with their child during their time at school, as well as in the home using Montessori principles, materials and theory. Through this early exposure to Montessori theory and practice, both parent and child will learn about Montessori methods, food preparation, care of self and the environment, as well as the class structure of a typical morning in a Montessori classroom. The Thursday morning class will run with 2 sessions for 1 hour each.